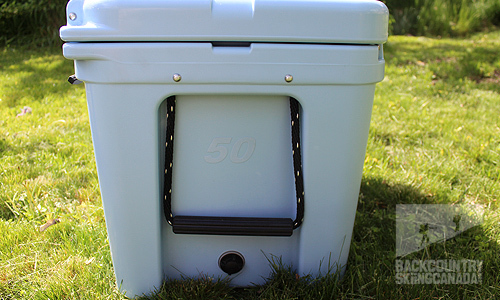 The Yeti Tundra 50 is a solid cooler built to take a beating and keep on going. Appropriately named for the abominable snowman, both are resilient, elusive, impervious to UV rays and also weather resistant. 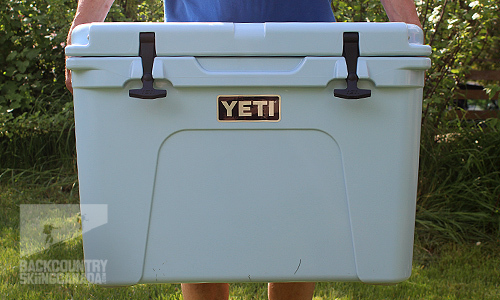 A five hundred pound man and a grizzly bear couldn’t break the Yeti (cooler, not monster). It’s perfect for car camping, hunting, power boating and drinking with friends who have the tendency to break things. 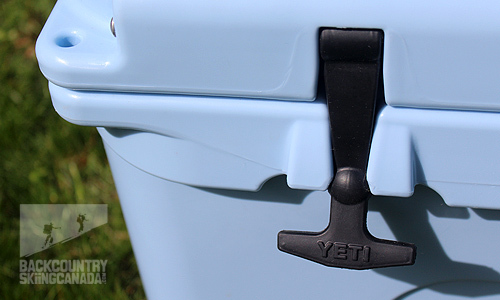 The Yeti Tundra 50 has a smaller footprint than the standard cooler size, but it’s deeper which makes it a better seat and step. 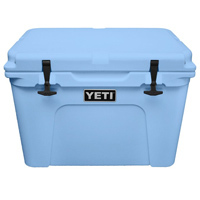 The Yeti Tundra 50 is a short and deep, medium sized hunting or car camping cooler, Yeti makes many more sizes for those that want a larger or smaller one. You might not want to hike too far with the Yeti Tundra, especially if it is fully loaded. The DoubleHaul rope handles make it easy to share the load with a buddy, and built in extra deep cooler handles are easy to grip solo. It's smaller than normal footprint wedges perfectly in an inner tube for river floats! Double Haul handles make it a breeze to carry with a friend, and when fully loaded you’re going to need them! The Permafrost Insulated walls are very thick, as you can see, much thicker than your average cooler so retaining either hot or cold is no problem for the Yeti Tundra Cooler. 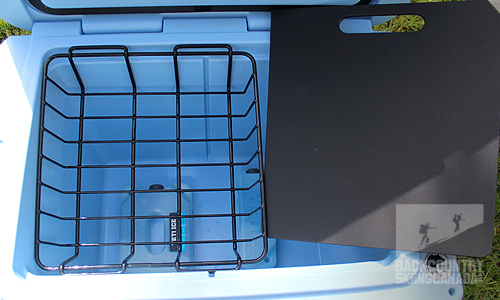 The freezer like lid seals nicely and well thought out hinge designs allow the Tundra cooler lid to stay open while you rummage for that last cold beer. Rotocasting is used to make the two-inch thick cooler mould, which is later filled with polyurethane foam Permafrost Insulation. Depending on content and weather variables, it will keep cold contents cold and warm items warm. I tested this by leaving a large bag of ice (with lots of interior space still free) in the sun for three days before the ice had fully melted, but many factors will influence this duration. Such as the amount of cold items versus air, inside the Yeti Tundra 50, how cold these items are, how often you lift the lid and the ambient outdoor temperature. 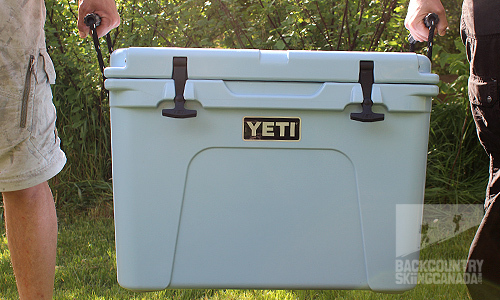 Yeti recommends you prime your cooler (and it’s contents) by pre-cooling everything for maximum performance. 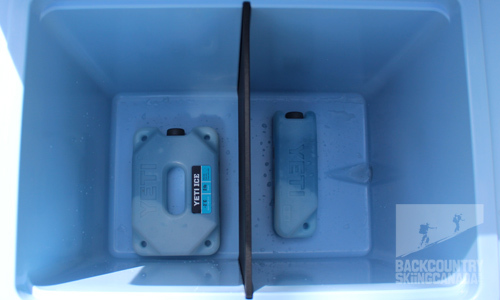 The rubber closers ensure a tight seal and a lock option is available on either side to keep the bears or beer poachers out. The Yeti Tundra 50 is not just a cooler; with the right accessory it can be anything from a comfy seat or step to a fishing rod or beer holder. We reviewed the divider accessory, which can also act as a cutting board. The Tundra only allows for a short divider, but longer cutting boards that fit lengthways are available in other cooler models. It works well to separate food and beverages but unfortunately it doesn’t fit while using the included interior dry goods basket which fits just under the cooler lid. However, this isn’t the case in most other Yeti coolers. Directly above the built in handle is a recess that will hold a number of accessories such as a beer or fishing rod holder. The DoubleHaul handle is easily gripped and is attached via a quality rope. The cutting board accessory also acts as a divider but is not compatible with the included hanging basket. Optional one and two pound ice packs are recyclable, non-toxic and biodegradable. The custom shape reduces freezing time and keeps cold longer than traditional ice. 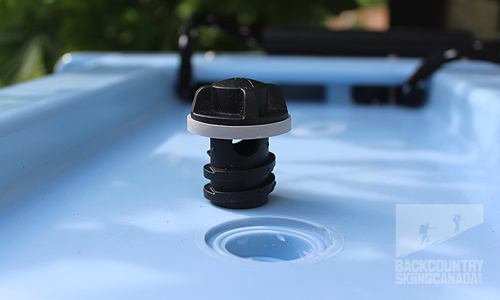 The fully removable drain could get lost, but it doesn’t need to be fully removed to drain the water as you can see with the hole above the threads. The Tundra models have an optional hanging basket to separate dry goods from the ice below. Unfortunately, the Tundra 50 isn’t compatible with both basket and cutting board divider, but you can still tuck the board along the side and take it with. 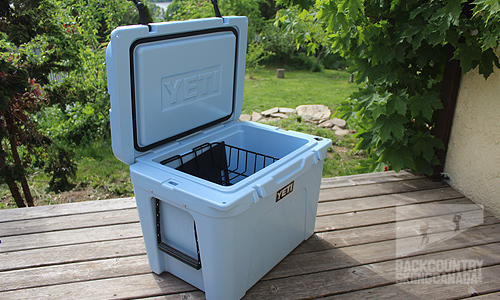 The Yeti Tundra 50 Cooler is “built for the wild”, with thick, well-insulated walls, and a bear proof locking system. It may be too heavy to hike very far, but is ideal for car camping, boating, hunting, etc. and it doubles as a seat or step. This luxury however comes with a hefty price tag, but it very well may be the last cooler you ever buy. All parts are replaceable incase a bear chews them off and the cooler itself comes with a 5 year warranty. Not all of the accessories are compatible so be sure you are getting what you want by reading their website carefully. I would recommend this product for car camping, or as extra fridge space at a camp or cottage, but look at other Yeti options for something lighter for hiking or larger for bigger groups. It’s nice to see that the time tested cooler design has finally been updated with some innovation! Custom logos are available (minimum order of 20) which won’t scratch, fade or peel. Super solid, potentially the last cooler you will need to buy. Able to padlock to keep bears out and contents safe. Basket & Divider accessories are non-compatible. Much heavier than traditional coolers. Threaded drain plug could get lost since it’s not attached in any way.